Everybody should have somewhat of a weight limit. Mine’s 75kg. The recent weeks have been worse with friends saying, “You look kind of swollen”, “Have you stopped exercising?” and “Your face very round ah!” All right, I get the hint and did feel horrible about myself. It is true that I have exercised a lot less due to an injury incurred earlier this year. 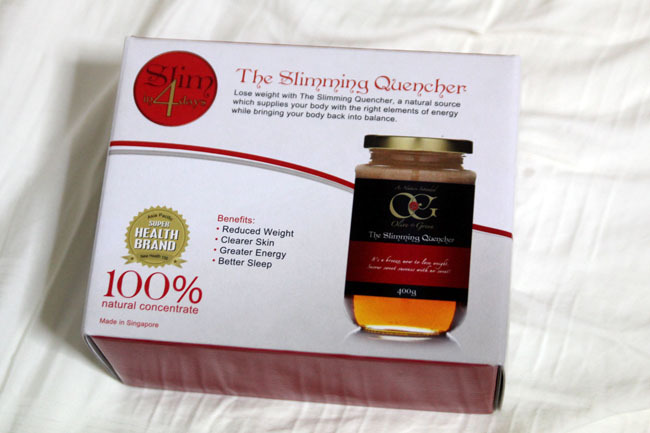 I never really took slimming pills and stuff, but when I read a write-up in 8 days on The Slimming Quencher by Olive & Green, a “delicious meal-replacement health drink that brings your body back into balance”, it called out to me to give it a try. Made from organic cactus honey extract, organic citrus extract, herbs and spices, this meal-replacement drink is supposed to detox and “wake up” the metabolism from its slumber. Sounds simple right? Here’s the catch – You cannot eat anything for 4 days! It may be easy for you, but never easy for a food blogger who eat good meals 4 times a day. I need to say that Olive & Green did not endorse me to write this. I do not get paid for this. I will be happy if they would (Haha. Any slimming company can write to me too, yah?) So I will say the truth. Not eating anything is NOT easy at all. And the drink is Not “delicious” – quite horrible tasting in fact, somewhat a cross between diluted tom yum and chilli water. Day 1 was terrible, though by Day 3 I got very used to the taste. It became bearable. I reminded myself it was honey. Going to dinner at Cocotte and drinking Still water (true story), watching Prometheus with your tummy calling out to you (also true story), and doing 3 Zumba classes (another crazy true story) in between was mental and physical torture. You need A LOT of determination. And so after 4 days, here are the results! But prior to that, the BEFORE pictures. Amazing right? 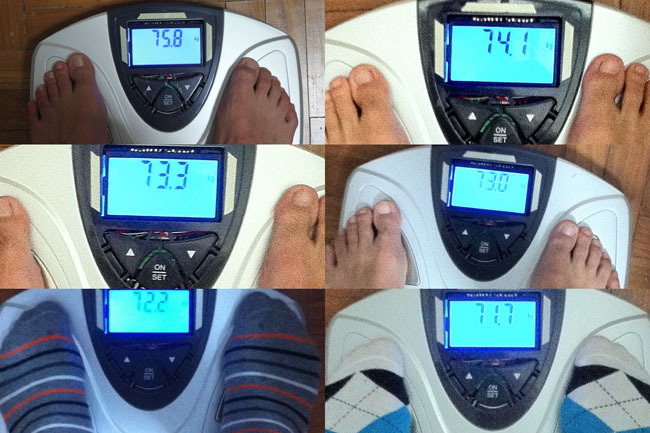 From 75.8kg to 71.7kg, in 4 days! 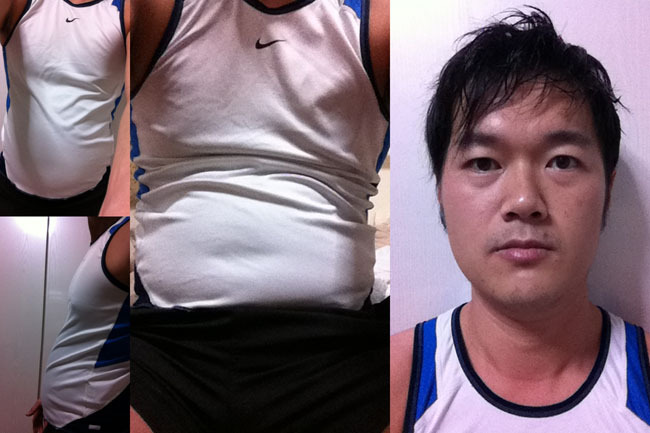 Though my weight fluctuates between 72 and 73kg these few days after the programme. 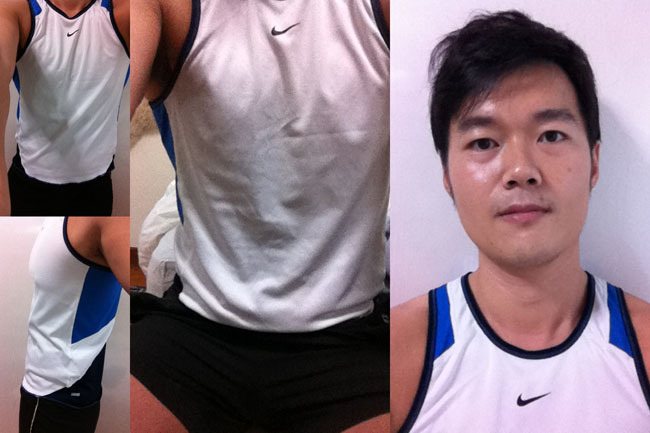 My friends say that my face do not look so bloated, as though I got rid of my water retention. Other than looking sharper, most commented that my face looks clearer, glower, with lighter eye bags too. I do notice during Day 3, my faces were very pinkish. I need to emphasize I do not advocate fast slimming. There is a part of me that feels it is still somewhat unhealthy, and eating healthily and exercising should still be the way to go. But I do value that Slimming Quencher helps me in detoxing. Some would say I would be just losing fluids. We shall see. Watch out for this space one month later. Hey Daniel, Amazing weight loss, did you do a fat loss analysis for this ? that would be interesting ..
No actually. Actually I just took it as a form of detox, without knowing what to expect! It’s quite good! Visit http://www.oliveandgreen.net to find out more on them. I tried this before and I went from 72 to 66. This drink lor…the first time i did it i went from 72 to 69 point something, then i tried again and went down another two, and again until now 66. Cos lately i’ve gotten lazy and just do 1 day hahaha. so what happens about 4 days? can you still eat normal food? 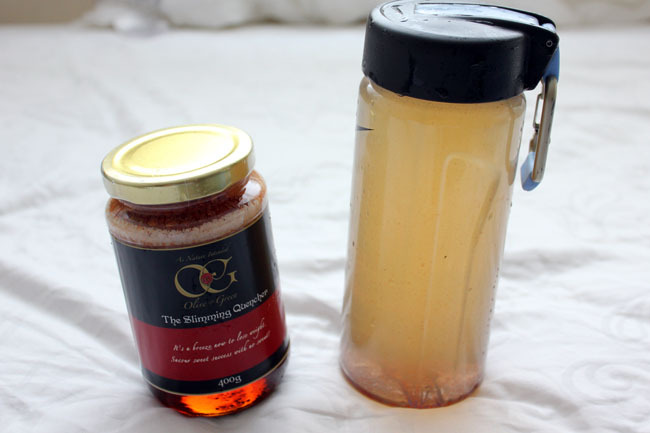 do you continue drinking the slimming quencher? Hello! The website says it’s $199 – a huge jump from the $96!! Did I look at the wrong product? Thank you! $199 I think comes with the other stuff such as organic lemon juice. I took the basic box. Just keep yourself really busy and drink loads of water. Stay off temptation! Eh, I am at Day 2 now and I only lost 1.2kg since Day 0! Followed all the instructions carefully… How come it worked so well for you? Hi, yes you can continue to eat normally after the 4th day and you need not have to drink it. However, it is recommended to go on this just once a month to clear your body and give your system a break after bouts of overeating. I think it took its concept from the “Master Cleanse” program.. but it detoxifying is always good! might try this one..
Hi daniel… Did you gain back the weight after the cleanse or it is constant weight loss? After reading ur blog, i decided to take up e challenge.. Im in e 4th day n frm 78 i drop to 74+.. tmr morning den will see e final result.. But my tummy really flatten much more even my colleagues who see me almost everyday commented tt my tummy is not as round!! But seriously alot of determination is needed.. Cant eat for 4 days is really torturous n worst thing is, i still haf to feed my gal w porridge n so tempted to eat her porridge..
Jia You Tricia! Tell me how it goes after you are done with the 4 days! i finished my 4days finally on Sunday .. i last drank the drink at 7pm (Saturday) and throughout did not drink anything as i attended WU BAI concert n the security doesnt allow any drinks to be brought in. when the concert end abt 1130pm i was so hungry and endured till the clock strikes 12. 1st thing i did when i woke up in the morning is to take my weight and it’s fixed at 75 and till today still 75kg..
during the 4 days of torture, it seems like my brain goes crazy abt food.. but surprisingly my appetite drop.. if i eat abit more, i will feel disguisted and eat lesser and interested in plain food. btw, did your weight bounce back?? 2 months later. Actually, nope, didn’t really bounce back. Yours? Hey Daniel! What you’ve written is very true – the drink tastes horrible indeed! It’s Day One for me now. I hope it does somehow taste better by Day Three. It tastes like vomit to me. (@_@) I’m gonna blog about the whole process too – I think you didn’t mention about the very frequent visits to the loo – does this inconvenient situation get better? I’m thinking of going to JB tomorrow. Can imagine being stuck in a traffic jam and needing the washroom! LOL! I actually went through it twice. A trip to JB with all the delicious food temptions and not being to eat anything is not advisable! views, I’m focusing on both you and your weblog site. Are you currently still interested?